The last few days Miss Maddy and I have been fighting a nasty head cold. There are several times throughout the day and night that we have both wanted something warm to drink, but I just didn’t have the energy to get up, put water on to boil, wait for it to boil and then steep the tea. Well, at least I didn’t have the energy to do this more than once a day. This is when I decided that I could do it in the crock pot and we could have a warm drink whenever we wanted. It worked like a charm! We were able to have a warm, soothing tea to warm us up from the inside out throughout the day. And when you’re not feeling good you just want something comforting and cozy to drink. In a 5 – 6 quart crock pot add the water. Put the lid on and turn to high. Once it’s warmed completely through (about 2 hours or after you get up from a nap… just sayin’) add the chamomile tea bags and steep for 15 – 20 minutes. 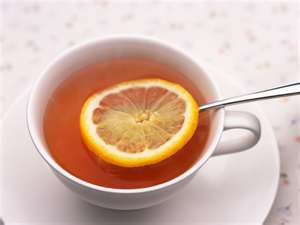 Once the tea has steeped, remove the bags, turn to warm and add the juice of 1 lemon. Slice the other lemon into thin rounds and add to the crock pot. When serving add the amount of honey you’d like to each heatproof cup before ladling the tea into the cup. Stir to incorporate and serve, making sure you add a slice of lemon to each cup (there’s something healing about the lemon that will help you to feel better…. I just know it!). This was perfect and stayed the perfect temperature throughout the day. Miss Maddy is feeling much better, and I’m sure I’m going to be feeling better in no time. In the meantime, I’ll make the crock pot chamomile and lemon tea so I only have to do the work once, but can have it any time I want a cup throughout the day.